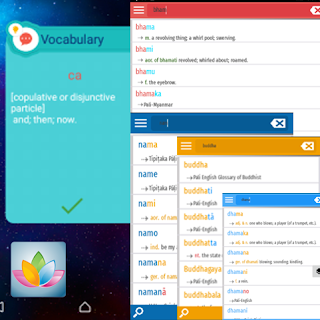 Find definitions for Pali words, study grammar and pick up new vocabulary with Pali Dictionary. Look up a definitions and thesaurus synonyms with a touch! Pali Dictionary's word search covers 500,000 Pali words, synonyms and antonyms. I have created several Pali-English dictionaries from material found on the internet: All of these electronic dictionaries are offered FOR FREE DISTRIBUTION ONLY by arrangement with their respective publishers. a. The first dictionary is T. W. Rhys Davids’s classic Pali – English Dictionary (PED) with over 17,000 entries and much additional information for many words. This dictionary has all the diacritical marks. b. The second dictionary is the Pali-English Dictionary, a large 20,000 word Dictionary from the Vipassana Research Institute.